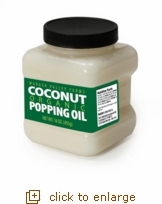 Our organic coconut oil (16 oz. plastic container) is the perfect choice for a healthy popcorn snack. It also makes a great addition when cooking or baking, or for healthy skin and beauty routines. *Percent daily values are based on 2,000 calorie diet. Your daily values may be higher or lower depending on your caloric needs.